For Me. Today is the very important day.Yes our first wedding anniversary and my husband birthday. To celebrate this wonderful day, I made this fabulous cake. 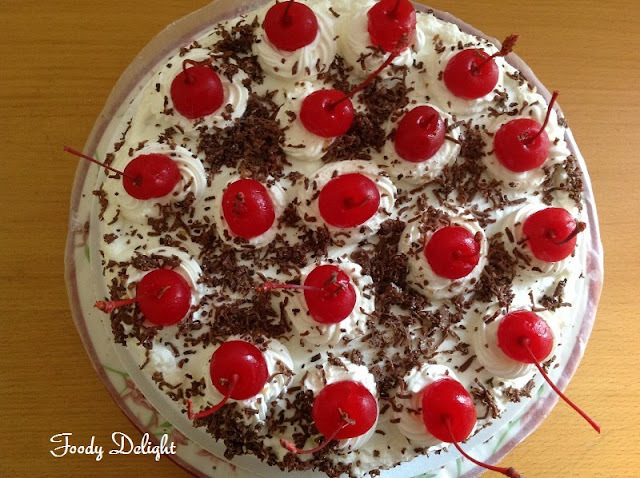 This is one of my favourite frosted cake and even my family love it a lot . 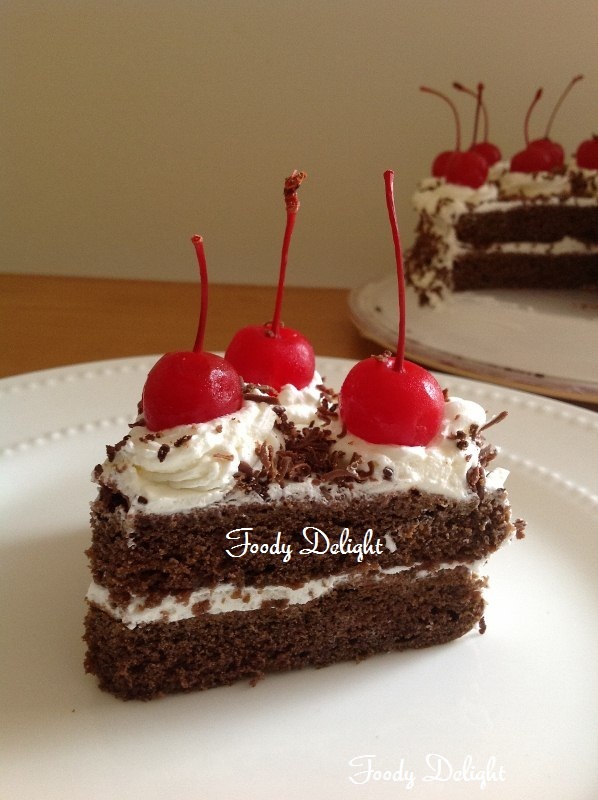 Black Forest cake consists of layers of chocolate cake, with whipped cream and cherries syrup between each layer. 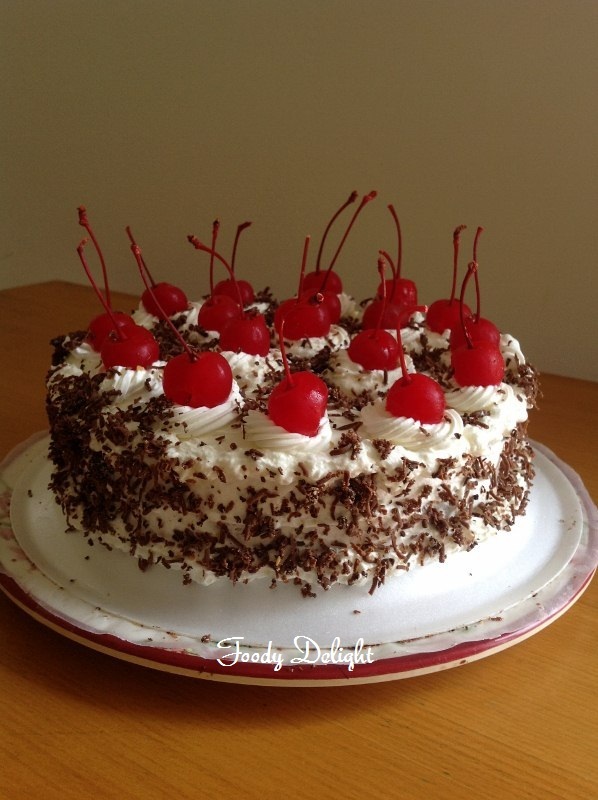 Then the cake is decorated with additional whipped cream, glazed cherries, and chocolate shavings. Grease the 9 inch cake pan using the cooking spray.Keep it aside. Combine softened butter, condensed milk and sugar into one large bowl.Mix until it is smooth. Sift all purpose flour, unsweetened cocoa powder,baking powder and baking soda in one another bowl. Add dry ingredients into wet ingredients and mix everything well. Now add vanilla essence into the mixture and by adding the soda(coke or pepsi) bring the cake mixture to the right consistency. Pour the mixture into the greased cake pan. Bake the cake for about 30 to 35 minutes or until the tooth pick comes out clean when it is inserted into the cake. When done take out the cake pan from the oven and let the cake cool for about 10 minutes. Then flip the cake on the cooling rack and leave the cake to cool down completely. Combine the chopped cherries,sugar and water into one pot.Bring the mixture to rolling point. Then reduce the flame to low and simmer the syrup till the cherries becomes soft. If using strawberries in the syrup ,just replace the cherries with the strawberries. Allow the syrup to cool down for some time. The syrup should be warm before using it onto the cake. Combine heavy cream, powdered sugar and vanilla extract into one large bowl. Beat till the soft peaks forms. When the cake cools down completely, carefully slice the cake into two halves and place the one layer of the cake on the decorating plate. Slightly prick the cake layer using toothpick or any thin skewer. Drizzle the syrup all over the cake layer. 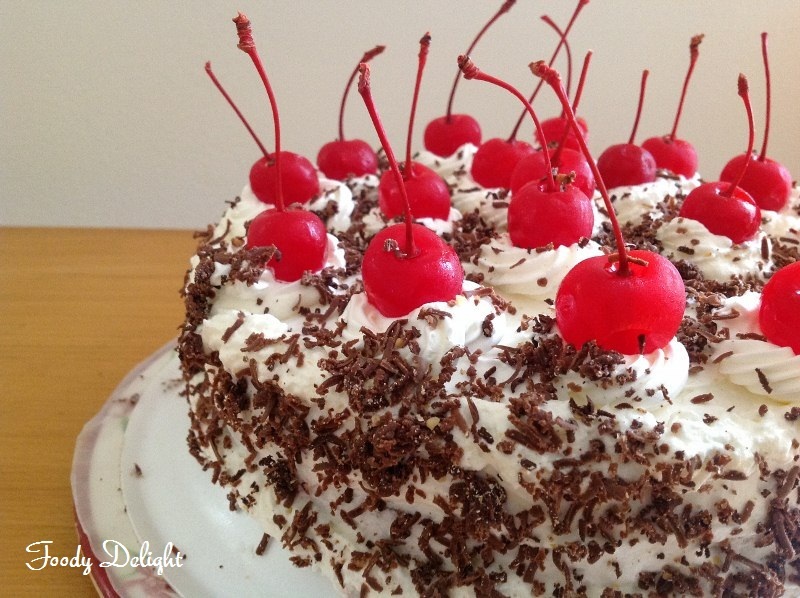 Spread the thick layer of frosting on the cake layer. Then place the second cake layer on the top. Spread out the remaining frosting on the sides and top of the cake. Smoothen the frosting all over the cake.If you find it difficult,place the cake into the refrigerator for 15 minutes. Then try to smooth out the frosting onto the cake. Decorate the top of the cake with chocolate shavings and glazed cherries. 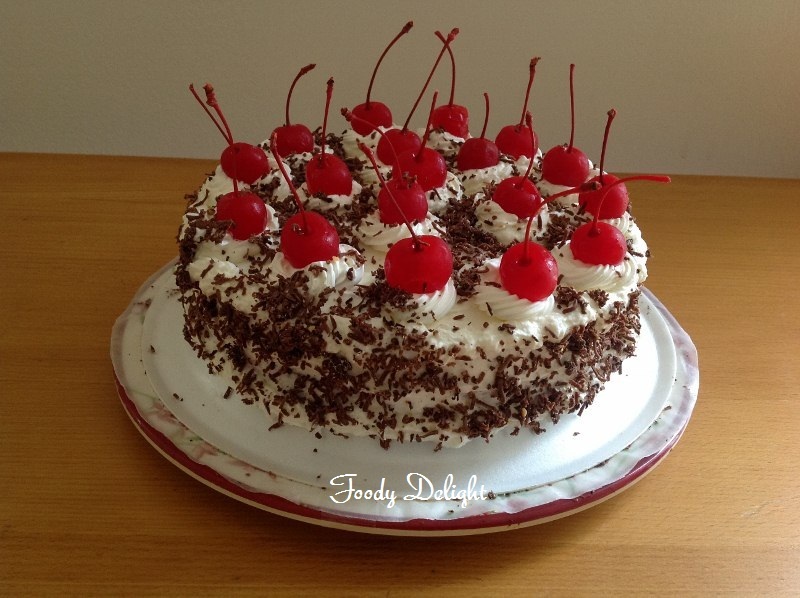 Refrigerate the cake for couple of hours before serving and Enjoy!!! Wish u avery happy anniversary :) the cake looks perfect! hope u having a wonderful day! Congratulations on your first wedding anniversary..also convey birthday wishes to your husband. Nice cake for a celebration. Happy Anniversay!! Hope u guys enjoying your day :) Black Forest cake come out really good n looks too delicious...well made!! Happy Anniversary and Happy Birthday to your Husband! Best Wishes on ur Wedg Annivrsy n Bday to ur hubby.this cake luks...DIVINE.gud job,so neat work.keep it up. Happy anniversary dear, cake looks so gorgeous. Happy anniversary and happy birthday to ur better half, cake looks extremely pleasing ,addictive and simple gorgeous. Happy anniversary! The cake looks amazing! Thanks so much for sharing, I'm definitely gonna try it too! Oh my goodness, this looks absolutely delicious! This looks exactly like a store bought cake my friend bought the other day. YUM! Thank you for your lovely cooment on my blog, wish you many more wonderful years of married life. A belated happy birthday for your hubby.